In office and retail construction, owners can delay opening without serious consequences. But if a school building is not ready on opening day, the community will be in an uproar. The solution is adequate planning. A good working estimate for a new school, from conception to occupancy, is three to five years. 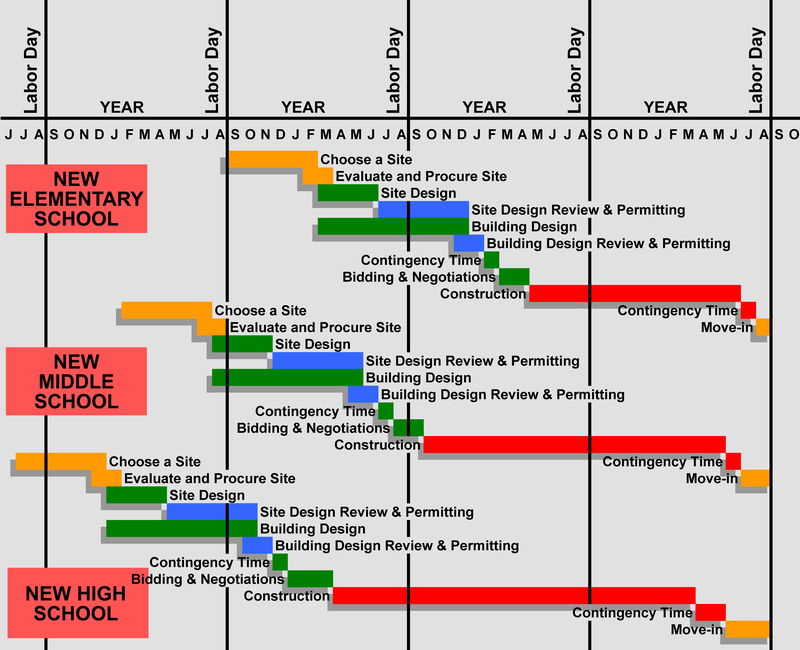 The project schedule’s length depends on a variety of factors, but is generally driven by the size and type of school (elementary, middle, or high school, and new or renovation). School board members and administrators who believe their school can be built faster than a normal project will likely set themselves up for failure. To prepare for the building process, school boards should maintain regularly updated capital improvement plans. Once a district determines that it needs a new or renovated building, it should take four to six months to look for, select, and procure a new site. Another one to two months should be spent on various site assessments. Selecting a qualified and experienced design team can take one to two months; the design process typically takes nine to 14 months. While the building design and site design should be done together and finish at the same time, each process follows a slightly different track. Site reviews and approvals can take six months or more, while a building permit review takes one or two months. Once the design and permitting processes are complete, the project is ready to receive bids from general contractors, a process that takes about a month or two barring contingencies. A district should expect a new elementary school to require 14-18 months, a new middle school to take 17-21 months, and for a new high school, 24-28 months. Move-in times are typically an additional one, two, or three months for an elementary, middle or high school, respectively. This schedule outlines the key milestone activities and durations to successfully build your new school. Qualified planners will be sure to include general contingency time for unforeseeable delays such as bad weather, labor and material shortages, poor soil, etc. The best way to manage all those deadlines is for the district to designate an internal employee to create and manage a project implementation schedule. While meeting the deadlines will be a team effort, the final responsibility should rest with the district. They have the most control over the front end of the schedule, where it is easy to fall behind schedule. If this happens, the problem is almost always impossible to fix; the district will need to make (or implement) contingency plans to open the building late—often by a whole year, not just a month. A responsible winning contractor will make a good-faith effort to complete such a project on time, but may also be prepared to pay liquidated damages (per day charges for each day late). Even so, team members may believe that a contract signed to complete a project on time means a rush job. That approach will make little difference come August, because an 18-month project usually takes about 18 months – not 12 or 14 months. Instead, school board members should equate the school design and construction process with a marathon, planning ahead and then maintaining an even, calculated pace throughout the process–coming in strong all the way to the finish.